I love your crap! That's awesome! I all of a sudden feel transported to the 1950's. . . I see no crap here. I LOVE the Salvation Army and Goodwill for stuff like this! One of my VERY favorite Christmas decorations is a fabric tree that I got at the S.A. 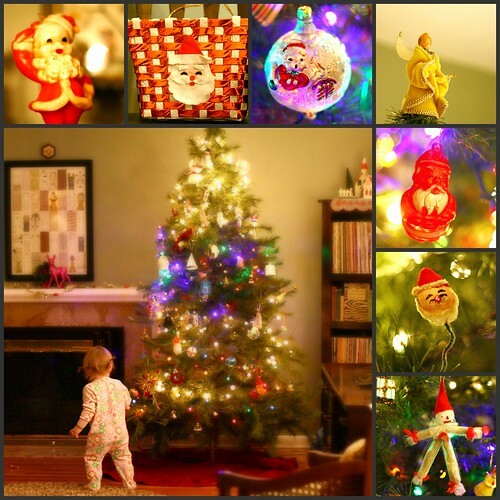 These are all lovely, but my favorite ornament is the one in pigtails in the lower left corner. I actually really like that photo of your little girl near the lit-up tree. It seems very magical and seasonal and...just right. I love this kind of thing. I still hope we get to go shopping together someday! I love that little guy who seems to be giving a salute! Wonderful stuff. Your Christmas Crap is adorable! Love love love it, so much personality. I can totally handle an entire month of your Christmas crap! It's fabulous and makes me smile. I actually love the lighting in this "crappy" post. It perfectly captures a Christmas evening in my mind. It also makes me want to drag my three kids around with my broken arm to various thrift stores and S & A boutiques around here. Crazy! Your husband seems so much like my husband... only my husband is NOT a crazed sports fan, he's an immunologist. I'm sure they'd get along famously. Ha ha ha. And, Erin, I also love the post you did of the picture of your grandfather. It's awesome. And it makes me want to cry.